Zeus was the king of the gods in ancient Greek religion. He was the god of the sky, lightning and thunder. Zeus was an all-powerful God who had lots of powers that may be witnessed across multiple stories throughout Greek mythology. In fact, Zeus was widely regarded to be more powerful than all the Olympians put together including his powerful brothers Poseidon and Hades. This was the primary reason why many of the other Gods and Demigods feared him and tried to trick him, rather than out-rightly challenging him. Famous Zeus symbols include the lightning bolt and the eagle. Here is an overview of the major powers of the Greek God Zeus. To begin with, Zeus, the God of Thunder, had the power to wield thunderbolts. He did this by concentrating vast amounts of energy in his hands, then aiming and hurling thunderbolts at his targets. His bolts could shear mountains, vaporize islands, incinerate entire cities and even boil the seas. His bolt were also capable of destroying the bodies of mortals, and even gods. Since Zeus was the God of the sky, he had absolute control over elements such as winds, thunderstorms, rain, moisture, clouds, lightning and weather. He also had the ability to control the movement of stars, govern the functioning of day and night, controlling the effects of time and decide the lifespan of mortals. It is believed that Zeus controlled the abilities of all his children and sisters, and could take their powers and grant them new ones at will. Apart from this, he was also extremely strong physically, enough to lift mountains. His strength exceeded that of every Olympian, except that of Hercules, who was his son. Another great ability of Zeus was that he was able to shape–shift or transform himself into other forms at will. Accounts of this ability are mainly witnessed in the tales of his sexual escapades. His disguises included that of an eagle, a satyr, a flame of fire, a phoenix, a shower of gold, a bull, an ant, an eagle, a shower, a lapwing, a swan, a star, a bear, a shepherd, a goose, a serpent and a vulture. 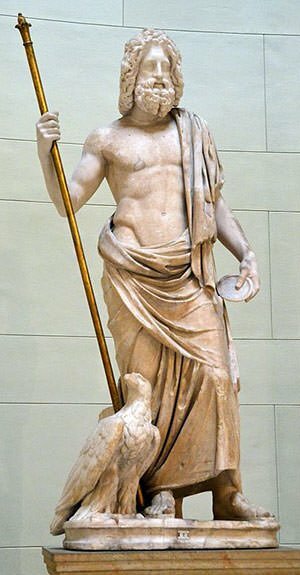 While serving as the god of the human race, Zeus presided and controlled elements of their societies including justice, law, honor, order, keeping of oaths, zeal, hospitality and leadership. He could control the events of battle and would kill the ones who broke their oaths. There are also accounts of him issuing prophecies at the city of Dodona. Apart from being immortal, Zeus is immune to all mortal diseases and conventional injuries. Zeus could also create inter–dimensional apertures in which he could instantly transport himself (or the Olympian army) from one location to another.